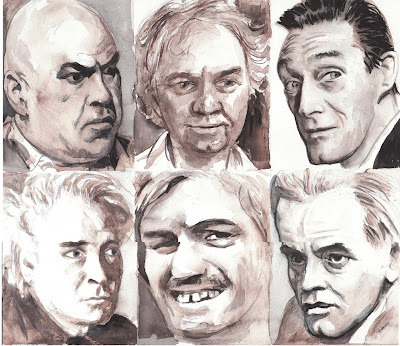 Last month I bought Quinlan's Illustrated Directory of Film Character Actors at a used bookstore up in Oslo. It has proved a delight, inspiring this drawing. I won't mention who these guys are--I hope film buffs (especially B movie lovers) will recognize some of their mugs. I will hint that two are in the land of the living, both 74 years old now. Quinlan's has a British style of clinical mercilessness, which makes for an entertaining read. He has a knack for hyphenated adjectives, honing in subtly on particular qualities that a said actor displays in his specific roles. "fair-haired, blue-eyed actor...with carved lips, Frankenstein Eyebrows..."; or "Tall, spare, permanently-wizened, beak-nosed, small-eyed, bald, parrot-like..."
Though arranged alphabetically, the book is designed for thumbing through, with good photos of thousands of actors. It's a different mentality than we seem to have landed in recently, what with the IMDB, which requires that one knows the name of the actor first off, before researching. I do love web surfing, but it's also nice to have good reference books like this on hand. The book seems to be out of print, another internet casualty. I'll have to fess up that I only recognize one or two of them -- but I enjoy the expressions and shadings.